With the halfway point of 2013 rapidly approaching, it seems unlikely that Dark Skies will be one of the more memorable genre offerings of the year—hell, it probably won’t even be among the most memorable Blumhouse productions of the year. That said, it is a film that always felt destined to occupy that space reserved for efforts that are solid enough to register on some level, and Dark Skies scored some solid hits with its casting. Keri Russell has seen a bit of a resurgence lately, and she’s a welcome presence here as the matriarch of a family that begins to experience bizarre phenomena (call it the Blumhouse trademark—it almost seems wrong that Jason Blum won’t be the one shepherding the Poltergeist redux to theaters next year). The specific nature of the phenomena is also welcome, as the typical ghosts and goblins are traded in for extraterrestrials. Like I said back in my original review, it’s an idea that I like more than the eventual execution since that specificity doesn’t come into play until very late in the proceedings. Before J.K. Simmons appears to unravel the mystery, Dark Skies could easily be another suburban ghost story, complete with the typical hauntings and creepy kid possession tropes. Back in my original review, I referred to the film as “Blumhouse’s Greatest Hits,” which is still apt—you’ve got everything from Paranormal Activity to Insidious in here, only there’s never a compelling reason not to watch those films instead of this one. More than anything, it just reminds me that I really wish Spielberg would allow someone to revive Night Skies, the ill-fated project that morphed into Poltergeist and E.T. back in the 80s—there’s certainly room for more low-key, extraterrestrial horror, a sub-genre that’s somehow been largely skipped over. 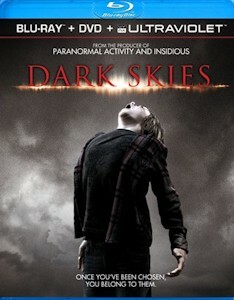 It seems appropriate that Dimension ended up distributing Dark Skies since it feels like much of that studio’s output during the 90s and early 2000s, right down to the sleek, polished look and the presence of a WB star (had Dark Skies actually been released about 13 years ago, Russell would have been moonlighting from Felicity). Dimension recently struck a deal with Anchor Bay to bring its titles to home video, and they’ve appropriately saddled a serviceable film with a decent (if not unremarkable) DVD/Blu-ray release. The presentation itself is more than adequate, as the high definition transfer is incredibly crisp and rich with detail, and only a few instances of artifacts (banding, mostly) hinder an otherwise fine transfer. A similarly strong 5.1 DTS-MA track accompanies the transfer and takes advantage of the film’s rich sound design, particularly during the supernatural sequences. The release’s extras are a little sparse, with a commentary featuring Blum, director Scott Stewart, executive producer Brian Kavanaugh-Jones and editor Peter Gvozdas serving as the centerpiece. During the course of the track, the quartet specifically discuss the film’s development and how it evolved from Stewart’s original found footage conception to the final product (it’s interesting that Blum actually prefers traditional narratives to found footage). Blum and Kavanaugh-Jones also discuss their now patented model of seeking out micro-budgeted films and what they want from a pitch (few locations, few speaking parts, etc. ), and, as the film progresses, the participants generally discuss how it came together in terms of casting and scripting. There are some expected anecdotes and a bit of obvious narrating throughout, but it makes for a solidly informative track that reveals just how especially sharp Stewart is when it comes to the various genre tropes (his breakdown of Simmons’s scene is pretty humorous and self-deprecating because he’s aware of how cliché these exposition dumps are). The only other supplements are 14 minutes worth of deleted, alternate, and extended scenes, most of which serve as filler. Most involve extra bits of dialogue or roving camerawork here and there—certainly nothing substantial that wasn’t better off on the cutting room floor. The most noticeably different scene is an alternate ending, which closes on a different, more nonsensical note, so it was a wise choice to go with the more creepily unsettling capper found in the final film. These scenes also feature an optional commentary with Stewart and Gvozdas and are also included on the standard DVD edition. Given the film’s low take at the box office, it seems likely that many will discover Dark Skies for the first time when sifting through the shelves at the local rental store (or the menus at the nearest Redbox, I suppose), where it'll hopefully fare a little bit better. While it's derivative and won't serve as a highlight in the Blumhouse oeuvre, it's a solidly crafted little genre effort that hits its mark more effectively than some more high profile releases this year.